Developers of Foldit's "Aflatoxin Challenge" believe this huge protein, called an enzyme, can destroy aflatoxin - but only if it's reconfigured in the right way way. Foldit users have already submitted close to half a million different arrangements. It wasn’t long after the invention of the internet that scientists discovered the potential for using computing power as a citizen science tool. One of the earliest examples was a computer program developed in the 1990s that allowed users to search for life on other planets. Now a new collaboration takes aim at something a little closer to home: An intersection between citizen science, health, and agriculture, with implications right here in the San Joaquin Valley. It’s 1 p.m. on a Friday, and Patrick Camarador is getting ready to livestream a video game. The UC Davis senior puts down his textbooks, puts on his headset and clicks on music. Some days, he plays games like Legend of Zelda or Splatoon, but for today’s game he puts on safety glasses and a lab coat. It’s a kind of inside joke with his streaming audience. “My name is Sockrates, also known as Patrick, and welcome back to Sock’s Lab,” he begins. 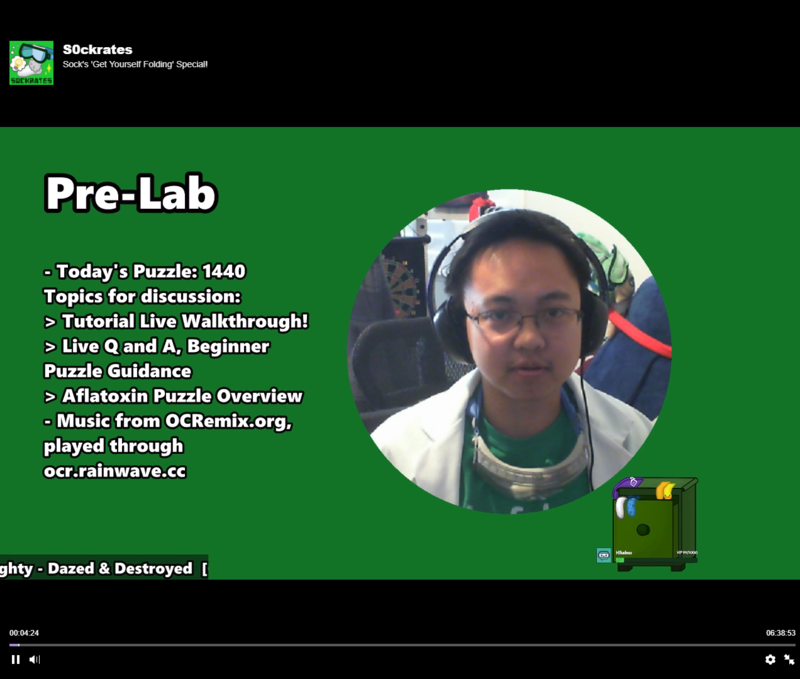 "Foldit Friday," which sometimes involves a lab coat and safety glasses, is a weekly feature of UC Davis senior Patrick Camarador's livestream page. The game is called Foldit. And it transforms hundreds of thousands of gamers like Camarador into citizen scientists. Rather than collecting treasure or destroying evil villans, the goal is to tweak the structures of proteins to solve real-world biological problems. Players get a molecular model of a protein and are instructed to fold, twist and rotate it into new configurations. They’re awarded points for efficiency. The game offers hundreds of molecular challenges. “Foldit is what I would describe as a protein folding sandbox puzzle game,” Camarador says. One of the newest puzzles involves aflatoxin, a family of carcinogens that contaminate crops around the globe and lead to serious health problems. 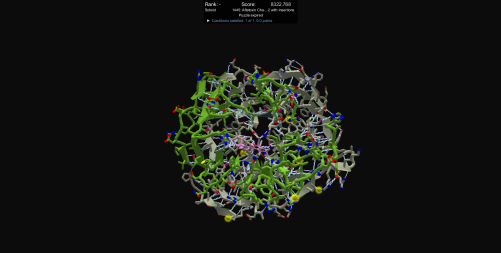 In Foldit’s Aflatoxin Challenge, players try to fold a protein into a shape that’ll break down the aflatoxin molecule into something harmless. Aflatoxin is the most potent natural carcinogen known. It’s caused by a fungus that can grow in crops like pistachios, peanuts and cotton. A single outbreak in corn in Kenya killed 125 people in 2004, while long-term exposure is responsible for tens of thousands of liver cancer diagnoses each year. Themis Michailides has been studying aflatoxin and other diseases afflicting agriculture for nearly 30 years. That’s why Themis Michailides is grinding up pistachios to test for aflatoxin. 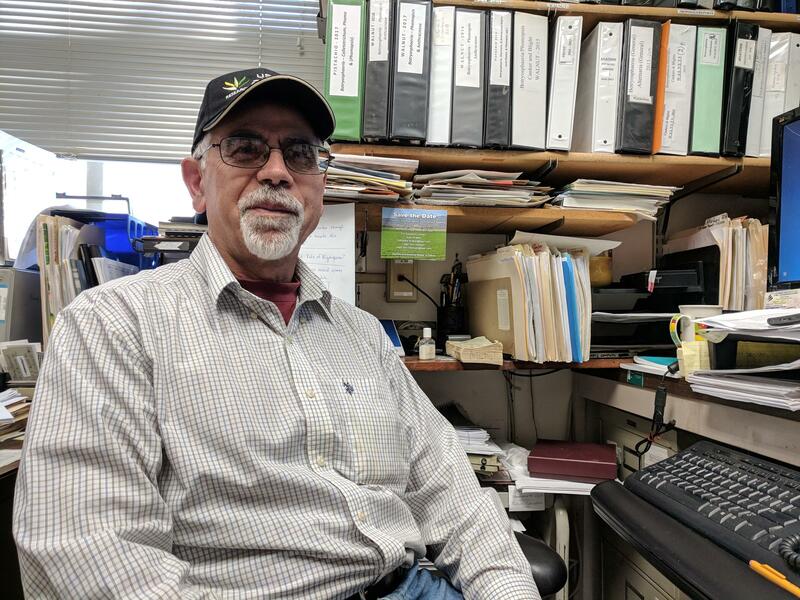 He’s studied plant diseases for almost 30 years with the University of California Research Extension in Parlier. “My emphasis is how we can manage it, how can we reduce it so that these crops are free from aflatoxin,” he says. Michailides says a lot has been done to control aflatoxin. Rigorous regulations prevent the compound from being a major health problem in the U.S. and Europe. But prevention is expensive, and still not 100% effective, despite a new biopesticide Michailides helped bring to the Valley. And the problem is far worse abroad. That’s why more solutions are needed—and why researchers are excited about an unorthodox strategy like Foldit. If experts like Michailides are struggling to find a solution, crowdsourcing it may seem like a surprising move. But it makes sense to Justin Siegel. He’s a biochemist at UC Davis and one of the minds behind the Aflatoxin Challenge. 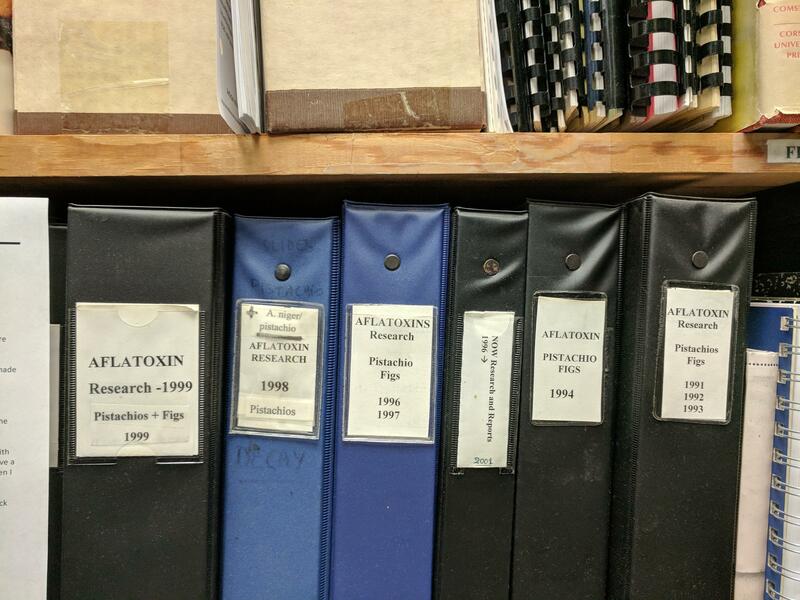 In his office at the Kearney Agricultural Research and Extension Center in Parlier, Michailides has dozens of notebooks organized by crops and their diseases. Foldit has a history of crowdsourcing difficult problems. In 2012, players redesigned a protein to speed up chemical reactions, and players have been listed as authors on a handful of scientific papers. 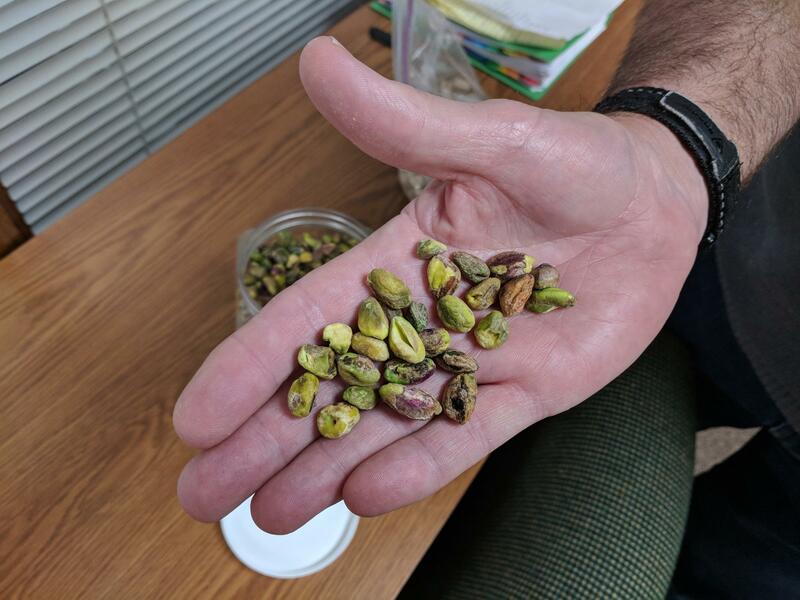 Bob Klein of the California Pistachio Research Board explains that visibly flawed and stained pistachios, like these that were sorted out from a local pistachio crop, are more likely to contain aflatoxin than healthy-looking ones. So could the Foldit strategy work? Barbara Stinson says maybe. She’s a senior partner with the Meridian Institute and a project manager with the Partnership for Aflatoxin Control in Africa. She’a excited about Foldit, but warns that local variations in climate, regulation, and the need to train farmers could make a huge difference in the effectiveness of the final product. “No matter what continent you’re using it for, those considerations need to be taken early and understand that it’s going to be different in different regions of the world,” she says. The final product will be important, but it’s only thanks to players like Patrick Camarador, putting on lab coats and playing a game between classes, that researchers may even get that far. 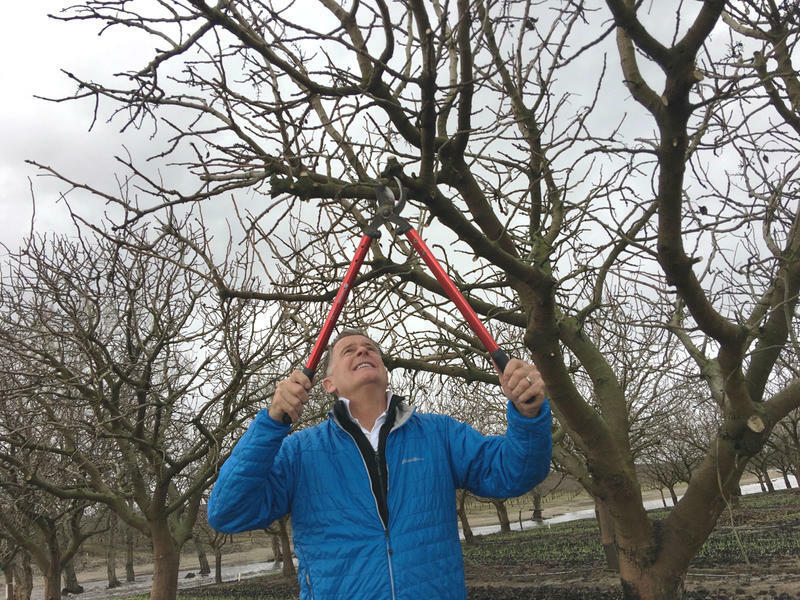 The valley’s fruit and nut trees need cold temperatures in the winter in order to go to sleep and wake up healthy in the spring. New research suggests that in as little as 30 years, it may be too warm in the valley to grow these trees due to climate change. Valley Public Radio’s Ezra David Romero reports that the agriculture industry is taking the issue very seriously. California has a new water problem, but it's not drought, and it's not endangered fish. Instead it's a roughly 20-pound creature that's described as an "invasive swamp rodent" called the nutria. It's already causing problems in Merced County wetlands and state officials worry the pesky and prolific rodent could further destroy already fragile ecosystems in the Sacramento-San Joaquin River delta and threaten the state's network of canals and levees.